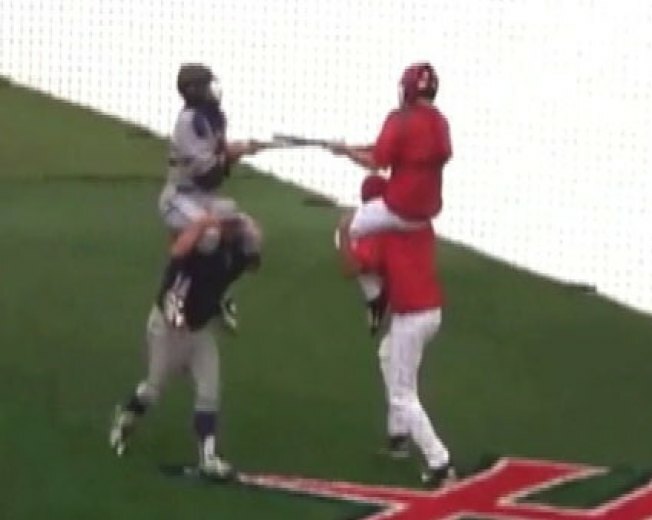 Rain delay antics in college baseball are common. Plucky and bored, the athletes come up with ways to entertain the fans, and more importantly themselves. Typical antics range from silly dancing to slip and slides on the tarp, but Radford pitcher Mark Peterson and first-baseman Jake Taylor (who went to local high school Good Council), came up with one we haven’t seen before. During an hour-long rain delay before a game between Radford University and High Point, the boys got creative with a little medieval fun. They grabbed a couple of Fungo bats and called out High Point’s catcher Kyle Mahoney and right-handed pitcher Corey Swickle. Seriously, kids. Do not try this at home. That means you, Drew Storen.